This year began with a new ban in Tanzania - all public hospitals were forbidden from televising entertainment programmes and told to show only health-related content. Since President John Pombe Magufuli, nicknamed "The Bulldozer", came to power three years ago, his government has been infamous for issuing hasty directives. Just days after taking office in late 2015, he cancelled the symbolic independence day fete and directed all the funds budgeted for the event to be used to widen a part of a highway notorious for gridlocks in the main city of Dar es Salaam. That was coupled with firing a number of government bigwigs in his anti-corruption crusade. Africans on Twitter loved all of it - the hashtag #WhatWouldMagufuliDo? saw other African presidents either being mocked or called into action to emulate the no-nonsense Tanzanian leader. Fast forward to 2019 and opinion about him and his regime is more divided. Here are five crucial bans that have shaped his image and that of his government both locally and internationally. In his first week in office in November 2015, Mr Magufuli halted all foreign trips for public servants. In cases of emergency, approval could be granted by Mr Magufuli or the head of civil service, he said. The move was welcomed with open hands by the public as civil servants were often seen as wasting taxpayers' money by making frequent foreign trips, some of which were not beneficial for the country, and doing so by flying in first or business class. To date, overseas trips for public officials are still limited, and although the president no longer issues approvals, officials must seek permits from authorities closely monitored by his office. A central bank report in early 2017 revealed that the government had saved $430m (£330m) by limiting foreign travel between November 2015 to November 2016. The president himself has not travelled outside East Africa since becoming president. He has only toured neighbouring Uganda, Kenya and Rwanda. His longest journey so far was to Ethiopia to attend an African Union meeting in January 2017. He is also on record as saying that he is skipping foreign travel to save money. In the 10 years before Mr Magufuli took office, the administration of his predecessor, Jakaya Kikwete, was shaken to the core by corruption exposes broadcast live on television. Parliamentary debates about the "Richmond scandal" - when a contract was improperly awarded to a US-based electricity firm and resulted in the resignation of Prime Minister Edward Lowassa in 2008 - were broadcast live. As was the drama over the "Escrow scandal" in 2014, which forced two senior ministers and the attorney-general out of office and implicated big business people, politicians and judges. 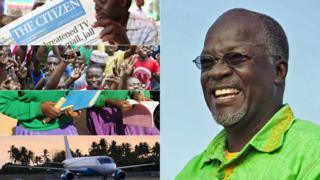 This made parliamentary broadcasts top viewing for many Tanzanians. But in early 2016, Mr Magufuli's government limited the coverage of the state-run Tanzania Broadcasting Corporation (TBC), and later extended this to private broadcasters. Broadcasters can now only air the morning question and answer session. The debate sessions are no longer shown live. The opposition and civil society organisations opposed the move, believing it was done to deliberately distance parliament from the public. Nape Nnauye, the information minister at the time, defended the decision, saying the monthly cost of 4.2bn Tanzanian shillings ($1.8m, £1.4m) to air parliamentary debates all day was too expensive for the TBC. He also said some Commonwealth countries had done the same thing to save money. To be fair, this was not a ban initiated by Mr Magufuli - though he did scupper an attempt to overturn the stipulation that pregnant schoolgirls be expelled. It has been the norm for more than four decades to expel girls from school in Tanzania if they get pregnant. For years human rights activists - and some politicians from both within the ruling CCM party and the opposition - have been lobbying for a change, calling for girls to be able to resume their studies after giving birth. A landmark moment for campaigners came in 2015 when the CCM manifesto promised that teenage mothers would be allowed to go back to school. The matter was then raised in parliament in May 2017 with the opposition and the Committee on Social Services and Community Development advising the government that it was right to amend the policy. However, this led to a heated debate and divided the house into two camps. Notably among those who resisted change was former First Lady and MP Salma Kikwete. A month later, at an event to inaugurate a new road, attended by Mrs Kikwete, President Magufuli declared his standpoint on the matter, saying his government would not allow teenage mothers back into mainstream education. The decision has been widely criticised, and last year the World Bank withheld an education loan of $300m to Tanzania, demanding the country change its policy. Interestingly, the country's semi-autonomous archipelago of Zanzibar does allow girls with children back to school. As soon as he took office, Mr Magufuli made it clear that he did not want to see political leaders criss-crossing the country rallying support. He argued that people should be left alone to focus on "building the country", and political leaders should wait for the next election in 2020 to hold rallies. However, the move has affected opposition parties which tend to use these gatherings as a way of organising grassroots support. The main opposition Chadema party announced a defiance operation, calling for nationwide protests in 2016, but backed down shortly afterwards. Police have since cracked down on a number of opposition politicians, who are accused of defying the order - most of whom are currently standing trial. Mr Magufuli's critics also accuse him of cracking down on other freedoms of expression, by requiring all bloggers to register and pay high fees for a licence to publish. Laws overseeing the media have also been toughened and a number of newspapers and radio stations have been suspended for "incitement". President Magufuli has often warned about fake news in the wake of articles critical of the government, saying there are limits to press freedom. "I would like to tell media owners - be careful, watch it. If you think you have that kind of freedom, [it is] not to that extent," the president said in 2017, reminding journalists of the new laws and a new code of conduct overseen by the information ministry. In August 2016, Mr Magufuli announced a ban on the export of metallic mineral concentrates. Miners in Tanzania had been sending heaps of earth containing metallic ore to Asia and Europe for smelting, but the content and quality had always been a contentious issue. The miners insisted it had a low commercial value. In March 2017, the country's largest goldminer, London-listed Acacia Ltd, was accused of flouting the ban. Mr Magufuli ordered the seizure of more than 250 of its containers at the port of Dar es Salaam. He then formed two teams to investigate the matter. The first investigated the contents of the containers, the second their value. Armed with the findings, Mr Magufuli's government slapped the company with a mammoth tax bill of $190bn, covering the 17 years it had been operating in the country. While Acacia denied any wrongdoing, its parent company Canada-based Barrick Gold, opted for talks. In October 2017, Barrick offered to pay the Tanzanian government $300m to resolve outstanding tax claims and would share equally any "economic benefits" from Acacia's operations in Tanzania with the government in future. But a deal has still not been agreed - and negotiations are still ongoing.